Hello, readers! Today I wanted to take a brief look at a new album that came out earlier this year from Sweden's In Mourning. Progressive metal rarely suffers from a lack of originality. Many interesting bands offer a diverse array of progressive-themed metal. 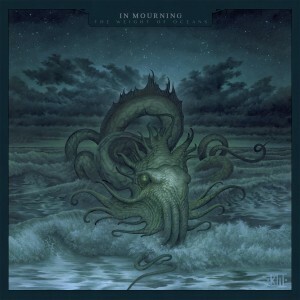 The Weight of Oceans is In Mourning's third album and is an effective followup to Monolith, released in 2010. In Mourning's mix consists of heavy, stomping guitar riffs played over a background of progressive-sounding keyboards. Vocals are mostly in the harsh, roaring category, and fill the foreground of the music with energetic metal vocals. At a few moments sparsly littered accross the album, the band breaks down into a slow section reminiscent of Opeth's vintage songs, when they introduce warming clean vocals. If you are into progressive metal music, you should enjoy In Mourning. If you don't like metal music at all, you won't like this. I thoroughly enjoyed Monolith and was excited when The Weight of Oceans came out. I'm happy to announce that I remain a fan of In Mourning. The Weight of Oceans floats ashore with 4.6/5 stars. Take a look at the album's opener, Colossus below. Enjoy and thank you for reading. Labels: In Mourning, melodic metal, Opeth, progressive metal. I really enjoyed this track except I prefer clean vocal as opposed to the growls. As you mentioned, it is tremendous progressive metal in the spirit of earlier Opeth. Hopefully, like Opeth, the move toward a cleaner vocal. Either way, kudos on this one!